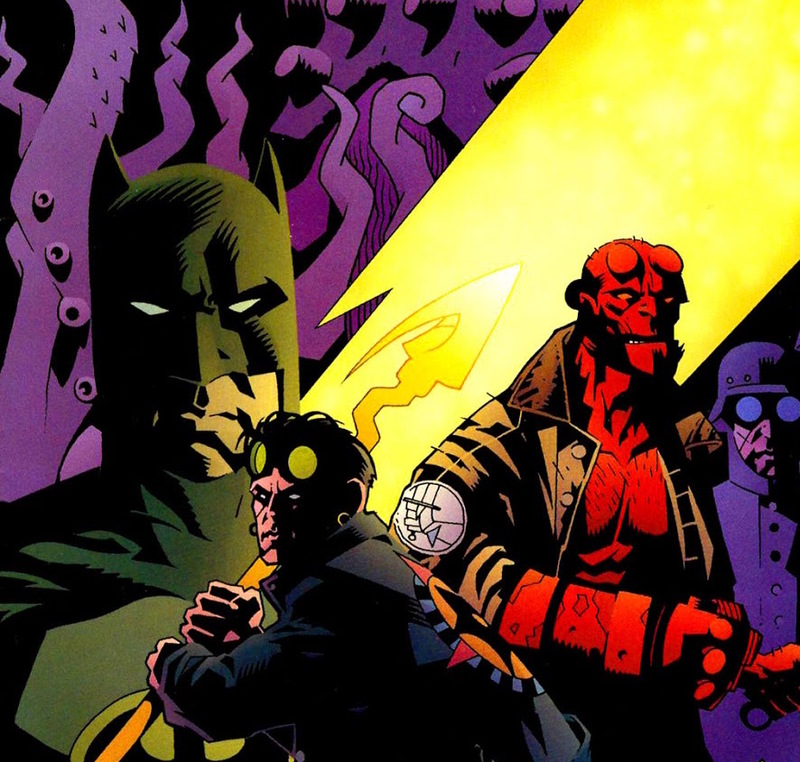 The strangest of bedfellows: 6 comic book crossovers you may have forgotten – AiPT! Alien vs. Predator. Justice League/Power Rangers. Archie Meets The Punisher. Even when they don’t quite make sense, comic book crossovers are usually a real fun time. Also, weeeeeiiiirrrrddd. With the impending release of the animated feature Batman vs. Teenage Mutant Ninja Turtles, now seems like a good time to look back at some other, slightly lesser known comic book mash-ups. From superhero-on-superhero violence to lighthearted meetings between wildly different characters, here’s the skinny on some overlooked crossovers, as well as why you should give them a read! Be aware of minor spoilers ahead, as well as brain-melting pop culture kookiness. It cannot be overstated how much of a Big Deal the ’90s Starman series was for comics fans. James Robinson took Jack Knight, the son of Golden Age Starman Ted Knight, and used him to tell thought-provoking superhero stories. Many were based on the idea of legacy and honoring those who came before while still striking out on your own. That makes Jack Knight such an obvious character to team up with Hellboy, a character so entrenched in heroic history. While the title bills this one as a team-up between the three heroes, it doesn’t quite work out that way. Batman sort of facilitates the meeting between Jack and HB, with Jack only appearing at the tail end of the first issue and Batman leaving at the beginning of the second. Whatever points the book loses in title accuracy, it makes up for with cool Lovecraftian action, with the second issue devoted to Hellboy and Jack Knight going up against Nazi scientists to save Jack’s kidnapped father and stop the resurrection of an evil ancient god. The miniseries is a fun, brisk read, made even more of a joy by virtue of Mike Mignola’s pencils. Having already established himself as a hell of a Batman artist, seeing Mignola go wild with Jack’s working class sense of style and Cosmic Rod is a real treat. Hullabaloo takes the term “crossover” to its literal conclusion, as both heroes get caught in the same wave of energy and end up as mixed-up hybrids of one another. Superman is stranded in Snap City without most his powers, whereas Madman gets a much more colorful costume and a heaping helping of Superman’s strength. Through this wacky encounter, both men learn to better appreciate the concepts of duty and heroism. It’s a really fun three-issue mini that boils the lead characters down to their essences, telling a touching story with both. In classic self-deprecating fashion, Mike Allred recognizes our shared grasp of Supes’ backstory, and instead focuses on a quick update on the status quo of Madman, the hero of Snap City. Superman and Madman are both great characters to use when exploring the idea of life as an outsider. Superman, for all of his public adoration, constantly struggles with controlling his own powers and always wanting to do the right thing, sometimes to his own detriment. Madman comes from a world where heroes aren’t appreciated and he is often mocked for his appearance and behavior. The story puts the two of them in one another’s boots, which makes for an effective exploration of both heroes. Most importantly, it’s bursting with the trademark humor of Allred’s main Madman series and the wide-eyed optimism that all of the best Superman stories have at their core. If you’re simply looking for a fun time with comics, look no further than this miniseries. Written by Mark Waid, Pulp Friction features a rotating team of artists, each of whom manage to feel distinct to their particular issue while still capturing all of the four-color excitement of a classic Will Eisner strip. Waid’s dialogue is purposefully cheesy and macho, with a complete sincerity that makes both of these self-proclaimed “tough guys” completely lovable. The ’90s film made me a fan of the Rocketeer as a kid, but IDW’s comics brought me back to the character within the last few years. The fact that the Spirit is along for the ride only sweetens the deal. Newcomers should snag this for a solid introduction to both characters. For longtime fans, reading this one is like coming home again. Two of Jack Kirby’s greatest cosmic creations clash in this prestige format story. While so many of the DC/Marvel mash-ups of the ’90s attempted to jump through various hoops in explaining how the two universes came together, this one refreshingly skips all of the laborious set-up and just allows these characters to exist in the same continuum. While the story is a whole lot of fun, partially recapping the histories of both title characters before setting them against one another, the real star of this book is John Byrne’s exceptional artwork. It’s unmistakably Byrne, but he indulges in the eccentricities that come with Jack Kirby’s classic designs. The massive spaceships, explosive magic, and fiery battles all feel distinctly Kirby, with the story itself unfolding like a sincere love letter to the King. This miniseries sees Batgirl (Cassandra Cain), Oracle, and Dark Horse Comics’ spectral assassin Ghost teaming up to stop a madman who has created a machine that raises the dead. Also, Two-Face is there. This one mostly works because the villains are appropriately campy, softening some of the darker implications of the overall plot. In fact, aside from the odd, slightly chauvinistic take on Bruce Wayne in this story, the characters are portrayed in ways that are very true to their respective series. In particular, it’s always a blast to see Barbara Gordon taking on more of a super-spy vibe as Oracle, directing these two women and putting all of the puzzle pieces together. She’s also much-needed from a story standpoint, as Cassandra was still a mostly mute character when this series took place. This one has been collected in a trade, but it’s worth scouring the dollar boxes for the individual issues. Each of Ryan Benjamin’s covers are striking. Okay, this one is honestly a bit of a mess. However, it’s such an ambitious, wacky mess that it’s still worth checking out. The short version is that Fox Mulder and the conspiracy-chasing Lone Gunmen have intercepted messages from the future detailing an apocalyptic virus. As they connect the dots and try to unravel the source of the virus, the Lone Gunmen cross paths with other IDW properties: the Ghostbusters, the Teenage Mutant Ninja Turtles, the Transformers, and the Crow. So, yes, it is a trash fire…but it’s still worth checking out. A concept like this one doesn’t come around very often. What are some of your favorite crossovers? Which ones do you feel have been overlooked? Let us know!